Harrisburg, PA – Governor Tom Wolf visited Dover Area High School to highlight the need for statewide broadband access to increase educational opportunities for Pennsylvania’s students. 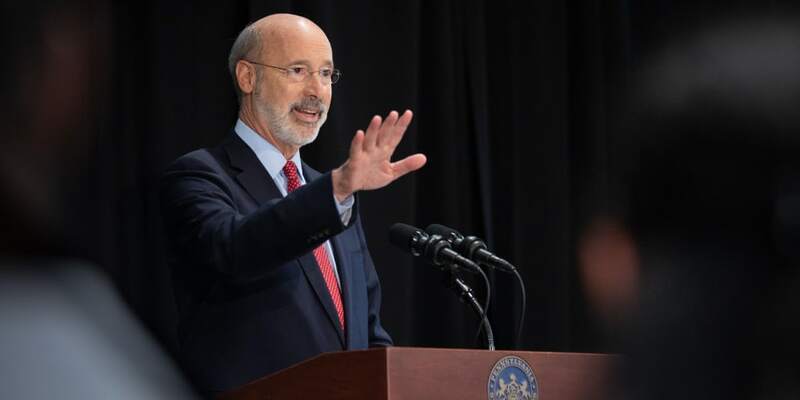 To achieve these goals, Governor Wolf announced a bold infrastructure initiative, Restore Pennsylvania, funded by the monetization of a commonsense severance tax. Restore Pennsylvania will invest $4.5 billion over the next four years in significant, high-impact projects throughout the commonwealth to help catapult Pennsylvania ahead of every state in the country in terms of technology, development, and infrastructure. Encompassing new and expanded programs to address five priority infrastructure areas including high speed internet access, storm preparedness and disaster recovery, downstream manufacturing, business development, and energy infrastructure, demolition, revitalization, and renewal, and transportation capital projects, Restore Pennsylvania projects will be driven by local input about local needs. Projects identified by local stakeholders will be evaluated through a competitive process to ensure that high priority, high impact projects are funded and needs across Pennsylvania are met. In Dover, the governor outlined how Restore Pennsylvania will help school districts by expanding broadband access to all Pennsylvanians. Nearly a million Pennsylvanians today lack access to robust, reliable, high-speed internet.